Note: Some GPS apps may have trouble finding Ridgecrest. 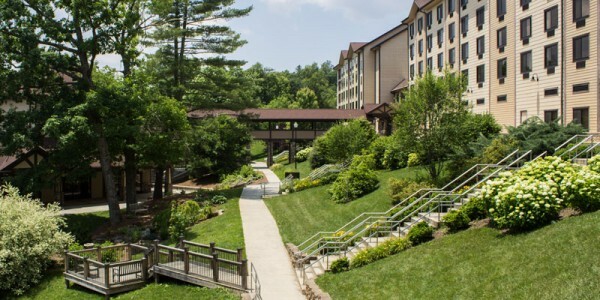 Nestled in the Blue Ridge Mountains just minutes from Asheville, North Carolina rests the tranquil LifeWay Ridgecrest Conference Center. Natural stone buildings and thick mountain laurel create a restful charm throughout the campus. The sunrises are spectacular, with ambient colors reflecting off the mountain mist. Ridgecrest’s beautiful 1,300-acre campus climbs from valley to mountaintop, offering elegant comfort in guest lodging and meeting space for over 2,000 people. Since its founding almost 100 years ago, Ridgecrest, a Christ-centered ministry, has welcomed millions of guests. Use of Ridgecrest, a LifeWay Conference Center, for this conference does not imply alignment with or endorsement by any Southern Baptist group. Have a question about Ridgecrest Conference Center? Something else? Contact us and we'll help you out.